Hi there, I'm back again to share a card and wish you a happy Friday! The image is coloured with Copic Markers and Liquid Applique was applied to Santa's beard and clothing. I love the look of Liquid Applique and how it puffs up when heated. It's something new for me and I'm hooked! A bell was hot glued to the twine, along with a touch of acrylic paint. 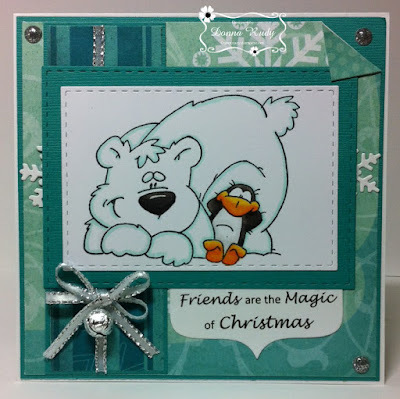 Two embossing folders were used to help create a snowy scene. 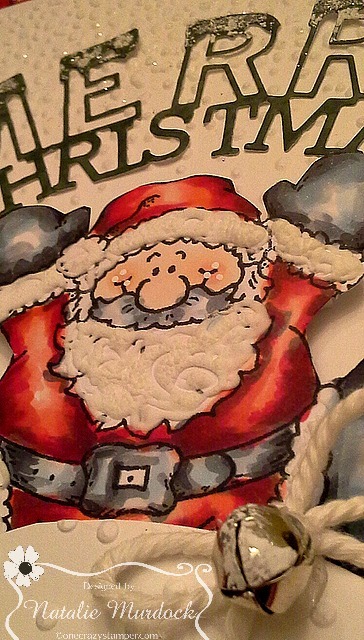 The hill was hand cut and Santa is pop dotted for extra dimension. A friend of mine gave me the Merry Christmas Die cut which I LOVE (thank you J)! 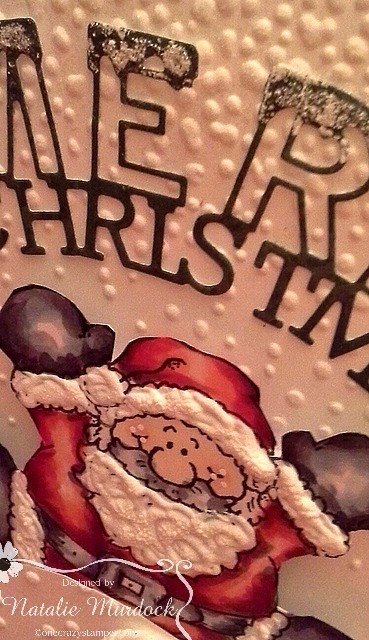 I added a bit of glitter and slightly curved the words almost like Santa is holding the greetng. Happy Wednesday High Hopes Fans! I can't believe it is almost the end of July already! Where has the month gone?! 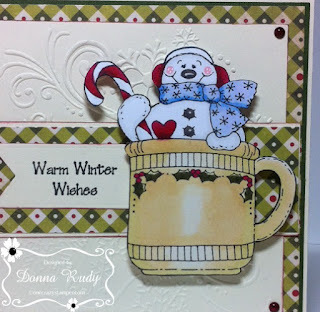 Today's card features "Catching Flakes" from High Hopes Rubber Stamps. This stamp brought back fun memories of standing out in the snow with those big wet flakes gently falling down and seeing how many we could catch on our tongue. After colouring the stamp with alcohol markers I used a stitched rectangle die to cut it out. I added some Stickles to the snow to give it some shine. I coloured the tree and added some Stickles to it after fussy cutting it out. The snow bank is cut with a die and it is the perfect spot for the sentiment. 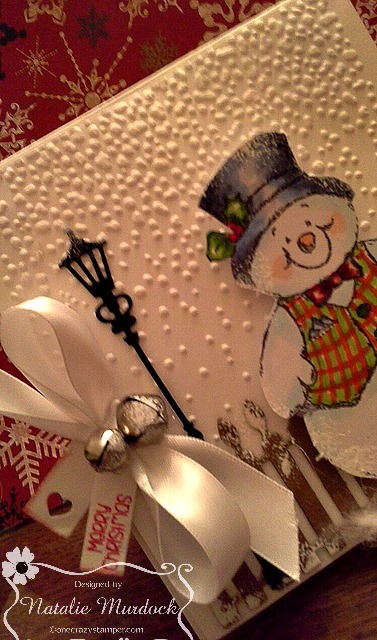 The paper is from Carta Bella and I added a few snow flakes to finish of my card. There is still time to play along in our Christmas in July Challenge. 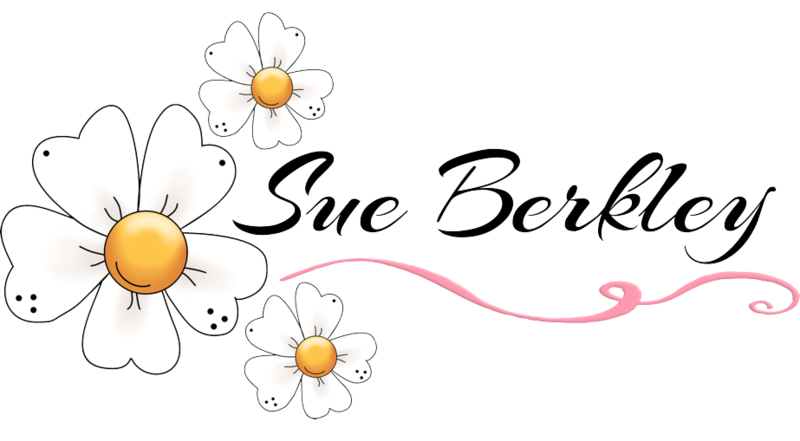 I can't wait to see what you create - here's the link to come play along. This is the last week for our "Christmas in July" posts here at OCS. 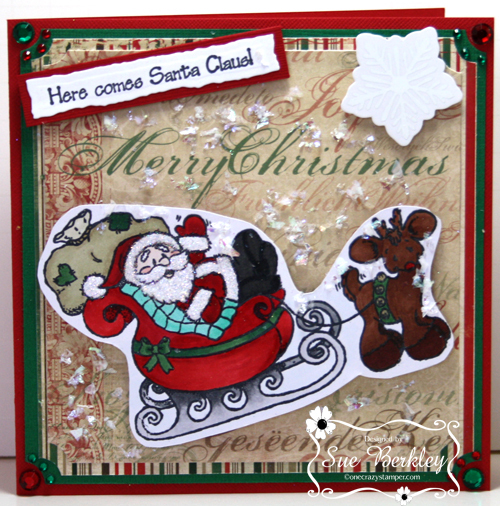 For my post today, I have used the adorable Santa's Sleigh Ride from High Hopes Rubber Stamps. 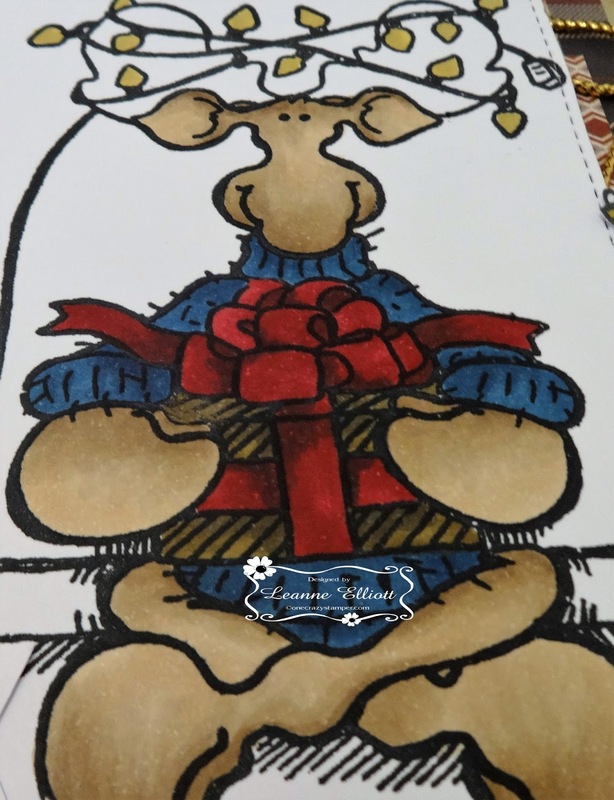 There are still a few days left to enter this month's "July in Christmas" Challenge for a chance to win 2 unmounted High Hopes Rubber Stamps of your choice. 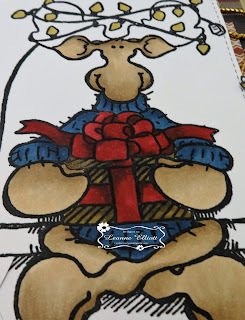 Mudzie's Gift was fun to color and create my card today for the challenge we have here at One Crazy Stamper. I added some lights and gold twine, colored my image up with Copic Markers. I hope you can play along with the challenge, and stop by the store and see what Lora has for you. Till next time, keep on crafting. Supplies: HH Mudzie's Gift, Memento Ink, Copic Markers, Xpressit Copic Blending Card Stock, Gold Twine, Carta Bella Pattern Paper, Glossy Accent, Glue Dots. Heartley Framed Snowman can be found here! soft cotton twine is also from OCS found here! 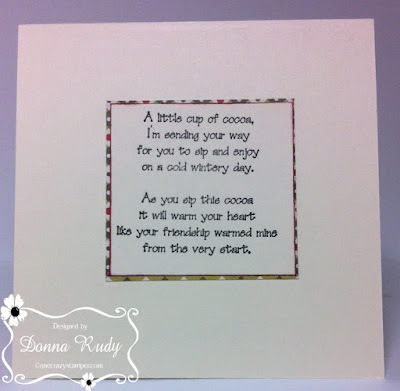 Pink acrylic paint was lightly sponged onto the card along with a hot pink button for an added touch of fun! Another week has gone by and I hope you have been enjoying the summer heat. OCS challenge theme this month is "Christmas in July". 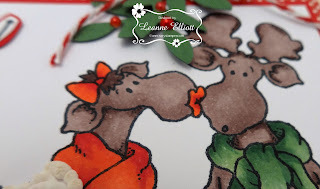 For my card today, I have used an older High Hopes Rubber Stamps called Christmas Carolers. 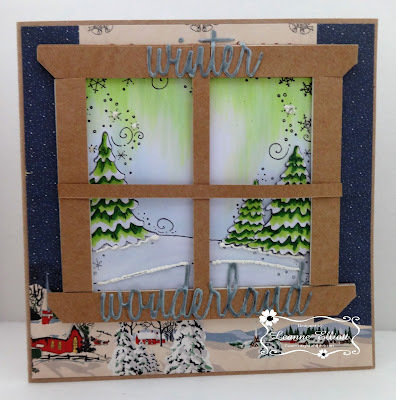 I added some Be Creative Sookwang Tape around the border of the image and then added some Frosty Mint glitter from Glitter Ritz on top. The background paper was foiled with Gold Reactive foil from Heidi Swapp. I have been wanting to do some quilling for quite some time, since taking a couple of quilling classes last year. This is the first time, I have made a quilled snowflake. 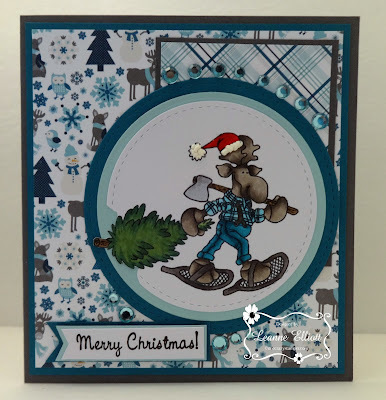 There is still time to enter this month's "July in Christmas" challenge for a chance to win 2 unmounted High Hopes Rubber Stamps of your choice. For any supplies that you might need , check out Lora's OCS store. Until next time, enjoy the summer and happy crafting. Merry Kiss Moose, isn't that funny, yes I thought so. 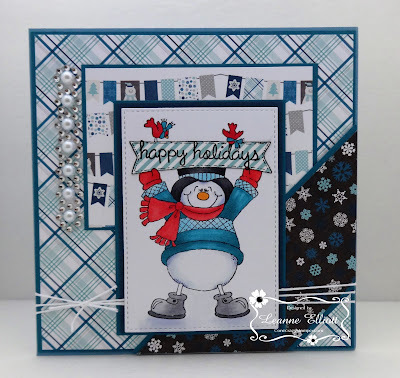 Today's card for the Christmas in July theme challenge here at One Crazy Stamper, is a older High Hopes stamp but so fun to create my card with. 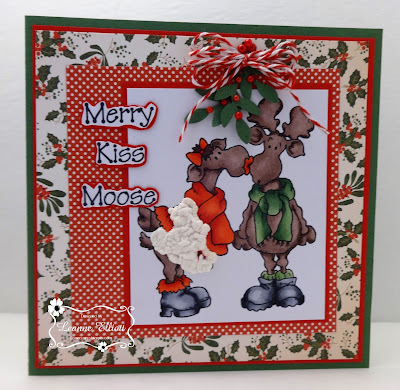 You can play along with this challenge here at One Crazy Stamper, and get this stamp at Lora's store, along with much fun supplies. Happy crafting! Copic Markers, Xpressit Copic Card Stocks, Memento Ink, Liquid Applique, Twine, Pearls. 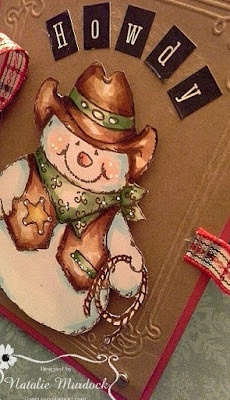 I've been colouring up this fun Cowboy Snowman from High Hopes and created a Christmas Card with this cute guy! Snowman Cowboy from High Hopes Can be found here! The image is coloured with Copic Markers, fussy cut and pop doted for some dimension. 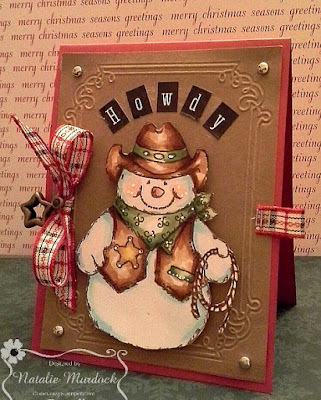 I decided to create my own text on the front of the card to read Howdy as the greeting. 2) Quit horsing around and have a Merry Christmas! 3) Kick off your boots and have a Merry Christmas! Such fun! My friend Cheryl came up with the last two sentiments and I love them both! It's a hard decision on which one to choose...... I think I'm going to use #2 !! Thanks for peeking, have a great weekend! Play along with us in this month's Christmas In July Challenge - here's the link to come play along. 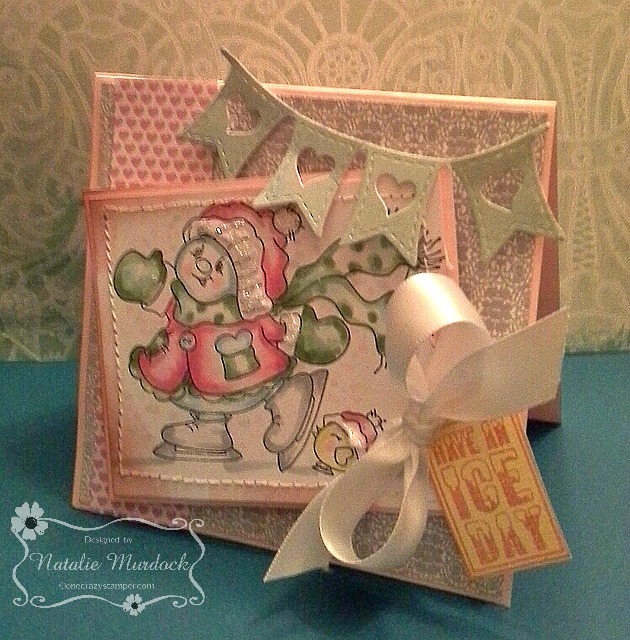 It's Christmas in July and today I'm sharing a super fun slider card with you. 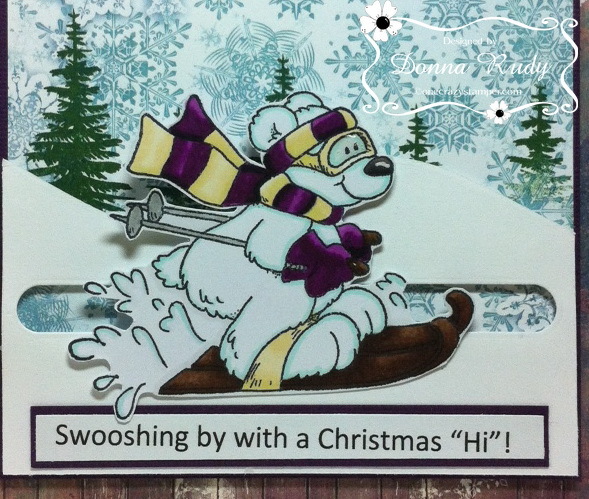 The stamp I used is called "Bearly Swooshin" and I thought it was perfect to make a slider card with. Personally I'm not a skier but this guy sure looks like he's having a great time! After colouring the stamp with alcohol markers I fussy cut him out leaving a thin white edge. I cut my background patterned paper and added some trees. I haven't made a slider card for awhile and I think this is the third one I have ever made so it took a bit off fiddling to get things together properly. Thankfully the "slider pieces" are a die so I could re cut the pieces as I made mistakes lol. The sentiment is printed from my computer and an icicle border die finish off my card. 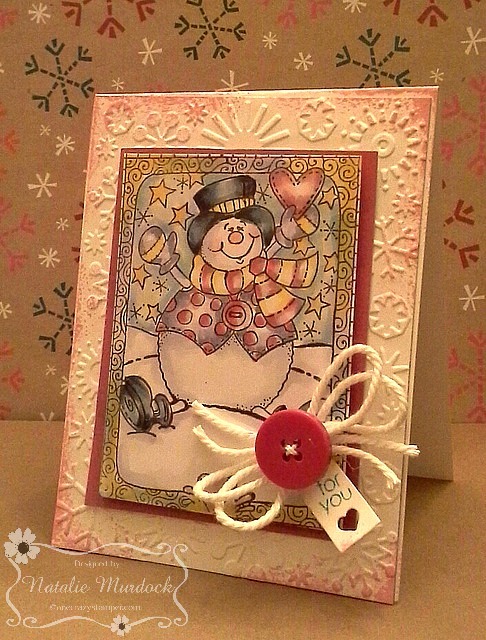 Tuesday has rolled around again, and continuing with this month's challenge "Christmas in July", I have used an older High Hopes Rubber Stamps called "Snowman Ornament". I paper pieced part of the ornament. 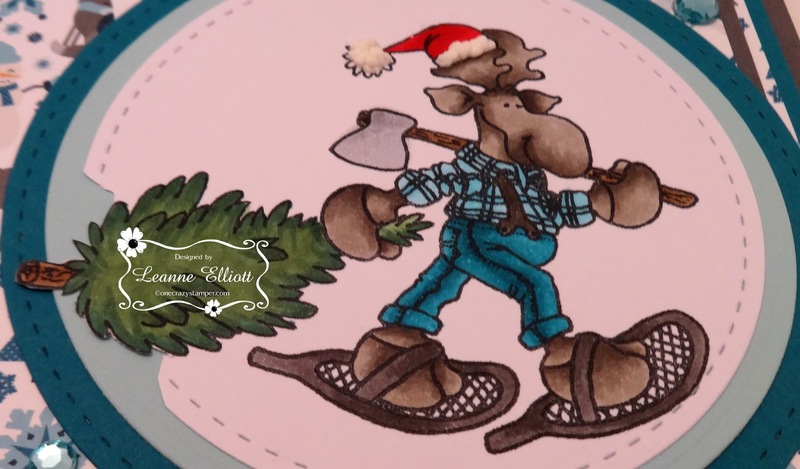 There is still plenty of time to enter this month's challenge "Christmas in July", for a chance to win 2 unmounted High Hopes Rubber Stamps of your choice. 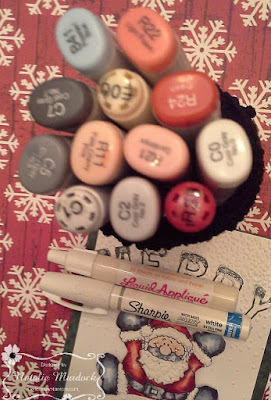 For any supplies that you might need or want, check out Lora's OCS store. Well thanks so much for stopping and today's card is for our month long challenge here at One Crazy Stamper and my turn to share my card with you today, and I had fun using this older but much loved High Hopes Rubber Stamp, Milton's Fresh Pine. I cut out my image using circle dies, and popped up the sentiment and colored my image using copic markers. I used Hello Winter Echo Park pattern paper. Used some liquid applique that stuff is so cool. I added a few rhinestones as well. 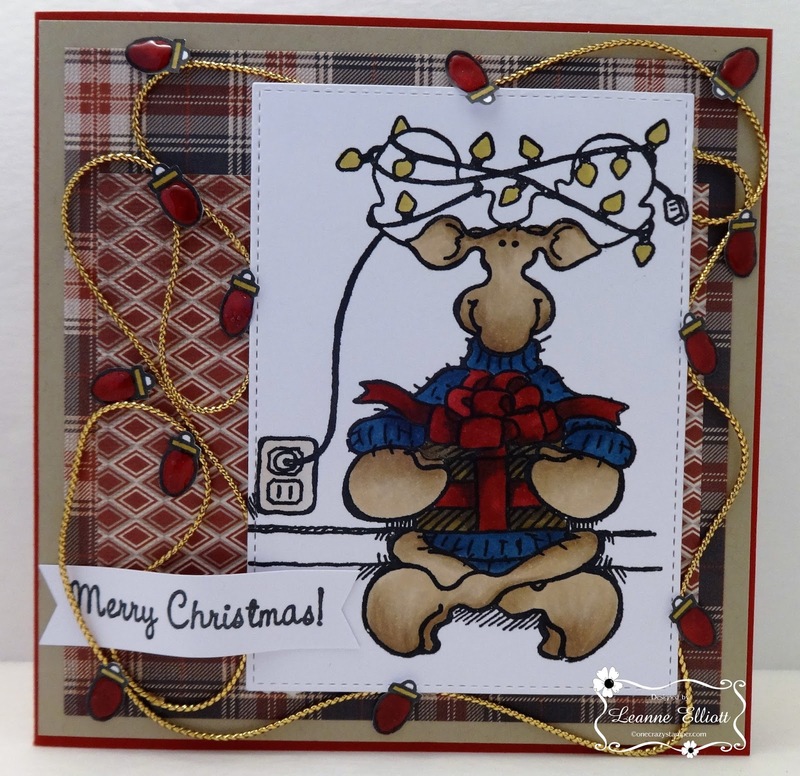 I hope you get a chance play our challenge as well as stop by Lora's store. Thanks again and keep on crafting. Circle Dies, EP Hello Winter Pattern Paper, Memento Ink, Liquid Applique. 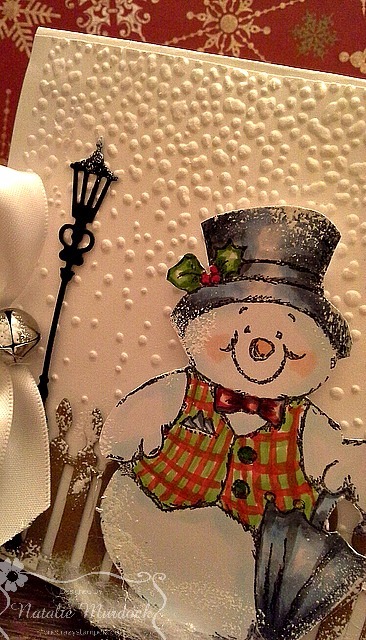 Just peeking in to say hello and share a snowy card with you. This is Dapper Dan , he's a classic snowman. The kind of snowman that you would see on the old school Christmas specials. 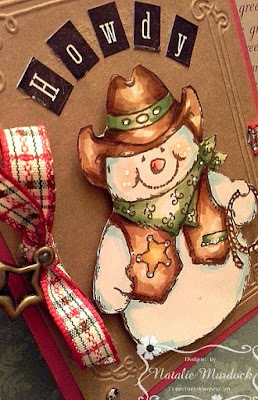 Dapper Dan Snowman from High Hopes found here! Bells, embossed background and a touch of cotton to set the scene! 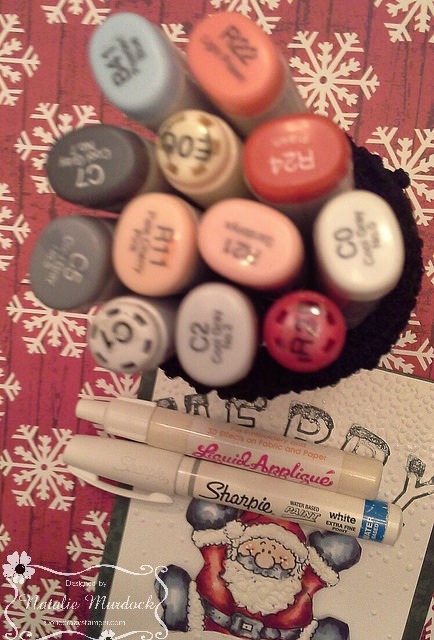 The following Copic Markers were used to create this Wintery scene! This month the One Crazy Stamper team is sharing cards made with a "Christmas in July" theme. 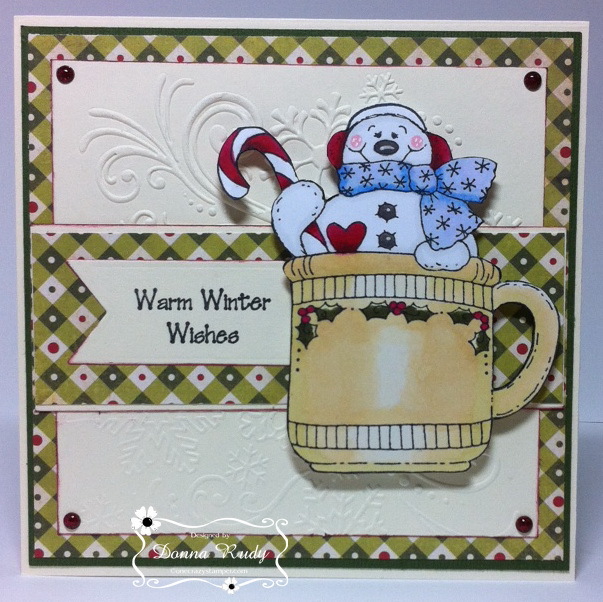 We will be using older High Hopes Rubber Stamps images featuring Christmas and Winter. There are so many fun, cute images to choose from I can't choose a favourite! 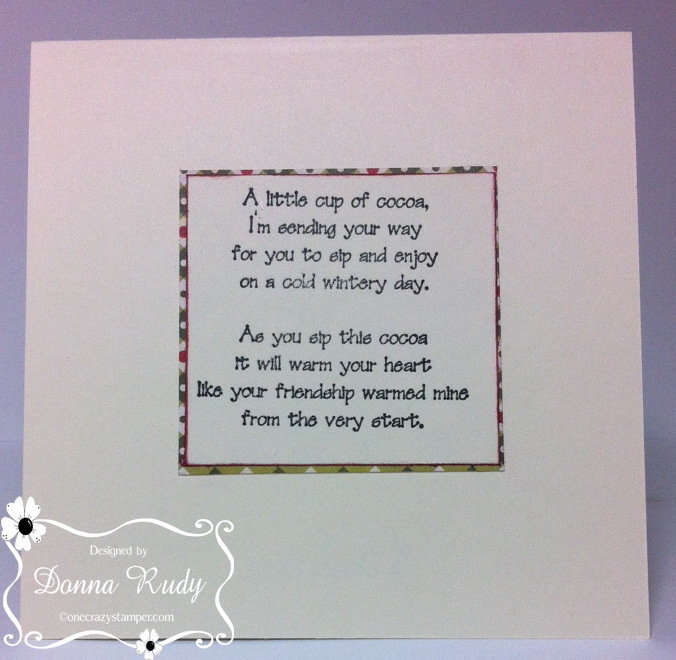 Today my card is featuring "Snowy's Cup" - who doesn't love a hot cup of cocoa on a cold day? I am also using the sentiments "Dot Warn Winter Wishes" and on the inside of my card I have used "Cup of Cocoa". Snowy is coloured with alcohol markers, fussy cut and mounted using 3D Foam Pop Dots. 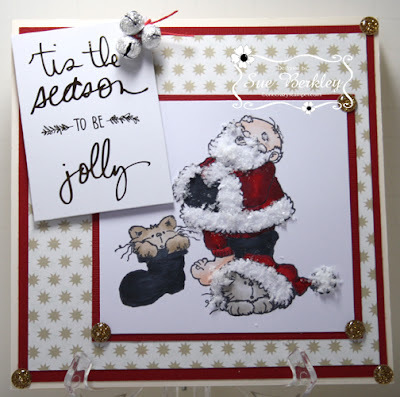 The front sentiment is stamped with Memento Tuxedo Black ink and cut out using a fishtail banner die. 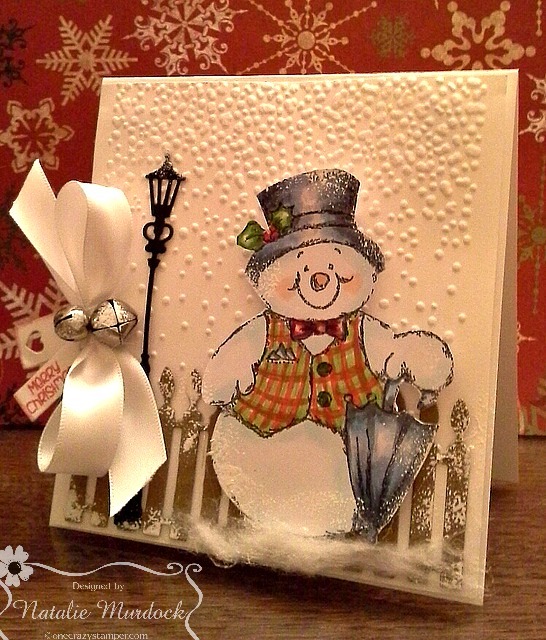 I created the background piece by running some matching off white card stock through a snowflake embossing folder to add some texture. 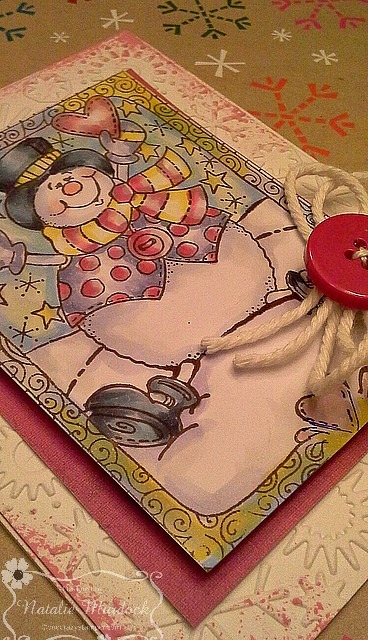 The edges of the off white card stock are edged with a burgundy ink and Candy Land glittered gumdrops finish of my card. The inside (sorry I had a hard time with this picture) has the same patterned paper and the saying is done on matching off white card stock and the edges are inked with burgundy ink. 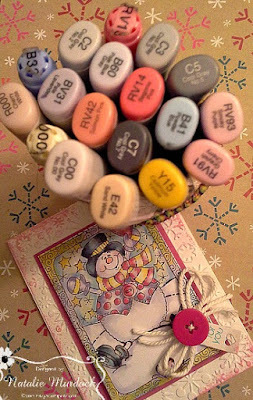 White Gel pen, Fishtail Banner Dies - Your Next Stamp, Colorblox Ink, 3D Foam Pop Dots - Forever In Time, Candy Land Glittered Gumdrops - Your Next Stamp. Hope you all enjoyed the long weekend with family and friends. Now that school is out for the children, summer is in full swing. As we are halfway through the year, and before we know it Christmas will be here. To get a start on the Christmas cards, OCS' challenge this month is "Christmas in July". For my post today, I have used an older High Hopes Rubber Stamp called "Christmas Joy Snowy". 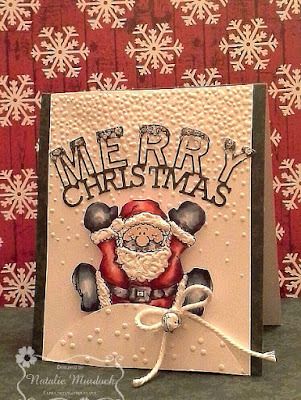 After cutting the image, I added glitter around the edge and some Faux Snow at the bottom. 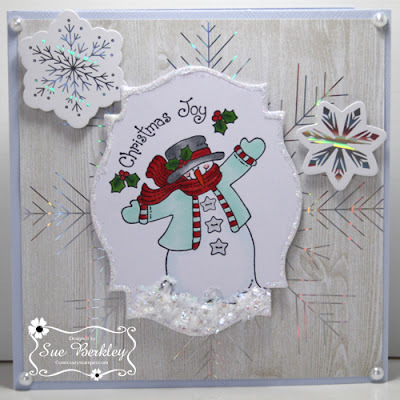 The background and snowflakes were foiled using the Heidi Swapp Foil Applicator and holographic reactive foil. You have plenty of time to enter this month's challenge which is "Christmas in July". For any supplies that you either need or your project or just plain want visit Lora's OCS store; online & brick and mortar. 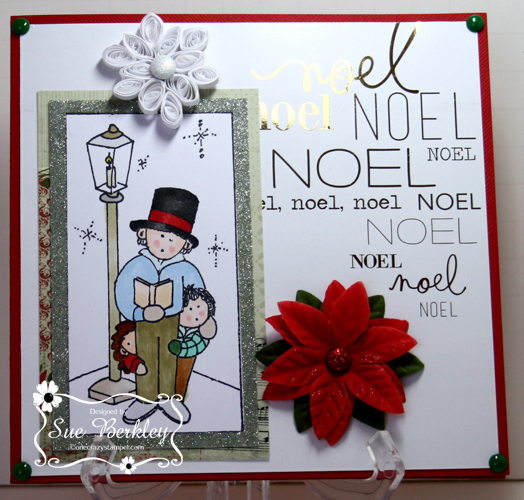 Hello friends, and welcome back, our challenge for the month of July here at One Crazy Stamper is Christmas in July. 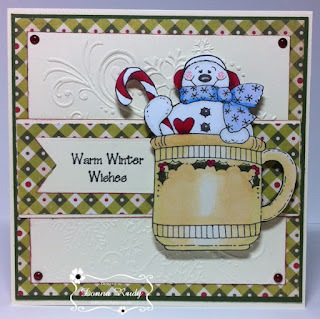 I thought I would use this High Hopes Rubber Stamps "Winter Wonderland Background" and it is so pretty. I wish the photos showed the wink of stella sparkle on it. Anyway, thanks for stopping here, look forward to seeing your creations here at One Crazy Stamper and remember to stop by Lora's store as well. Happy Crafting. Liquid Applique, Copic Markers, Xpressit Copic Card Stock, Craft Foam. July Challenge -- "Christmas in July"
July is here and OCS is back with a new challenge. The OCS Design Team will be using an assortment of older Christmas High Hopes Stamps for this month's challenge, which is "Christmas in July." You can use any stamp except for digital images. You have all month to join in the fun for a chance to win a fabulous prize from OCS. Misti, Tuxedo Black Memento Ink, Copic Xpress It Cardstock. Twine, Pearls, Xpressit Copic Card Stock, Copic Markers, Craft Foam Tape.